Urgent calls have gone forth--from the White House and Congress, from schools, churches, synagogues, and other agencies--for Americans to become more involved in caring for the needy and in serving their communities. And as federal and state governments across the nation cut back on aid to the poor and disabled, the role of volunteerism can only grow in importance. But how can we inspire caring behavior in our young when so many adults seem indifferent to the problems of the needy, when many problems (such as homelessness) seem beyond individual effort, and when agencies often come under fire for ineffectiveness if not corruption?Drawing on deeply moving personal accounts from young people who have become involved in community service, as well as on data from recent national surveys, Learning to Care looks at why teenagers become involved in volunteer work, what problems and pressures they face, and what we can do to nurture caring in our youth. Robert Wuthnow's intimate interviews bring to life the stories of high school student volunteers, teenagers such as Tanika Lane, a freshman who works with Literacy Education and Direction (LEAD), a job-training program for inner-city kids, and Amy Stone, a homecoming queen and student-body president at a suburban southern school who organizes rallies for AIDS awareness. Through these profiles, Wuthnow shows that caring is not innate but learned, in part from the spontaneous warmth of family life, and in part from finding the right kind of volunteer work. He contends that volunteers' sense of service is shaped by what they find in school service clubs, in shelters for the homeless, in working with AIDS victims, or in tutoring inner-city children. And Wuthnow also argues that the best environment to nurture the helping impulse is the religious setting, where in fact the great bulk of volunteering in America takes place. In these organizations, as well as in schools and community agencies, teenagers can find the role models and moral incentives that will instill a sense of service that they can then carry into their adult life.Robert Wuthnow is one of our leading commentators on religious life in America, the author of Acts of Compassion, which was nominated for both a Pulitzer Prize and a National Book Award. 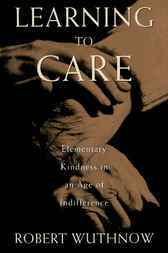 Learning to Care, the sequel to that highly acclaimed volume, offers an eye-opening (and somewhat reassuring) portrait of volunteerism among America's youth, as it helps lay the groundwork for teaching our children to care. Robert Wuthnow is the Gerhard R. Andlinger Professor of Social Sciences and Director of the Center for the Study of American Religion at Princeton University. He is the author of numerous books on religion in America and Editor-at-Large of Christian Century, to which he is a frequent contributor.